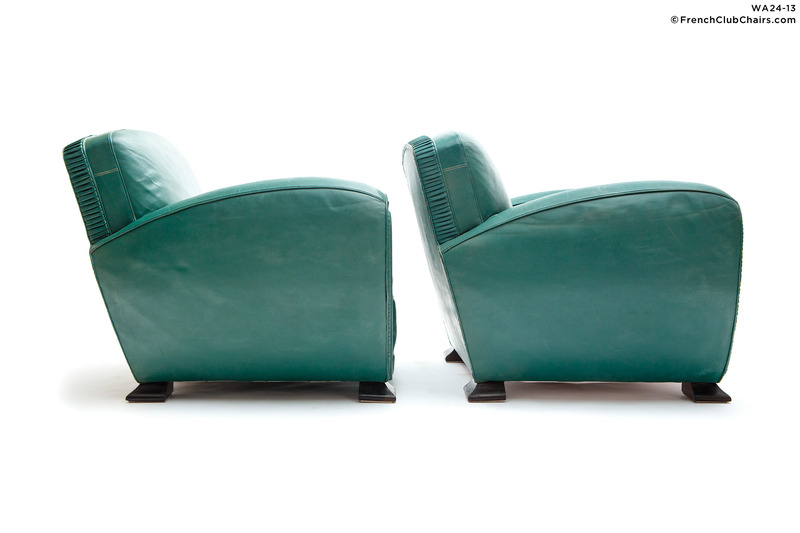 Amazing, Gorgeous pair of Erton Deco Ambassador Club chairs. This particular pair were ordered for the bureau of a roof tile manufacturer in La Creuse or les Midis, the center of France in the early ’40s. They were subsequently loaned for use in a filmed interview of MarcelCedran, after he beat world Middleweight champion Tony Zale. Cerdan became a world champion by knocking Zale out in the 12th round in Roosevelt Stadium, Jersey City, New Jersey on 21 September 1948. They feature their original leather which has kind of a sprayed on hue. They sit deep and comfor table and still have their original Erton tags attached to the bottom. Truly a rare and wonderful pair.